Tribes Overall: "Everything worked! Flights, connections, transport, greeters, food requirements and general organisation went like clockwork. We never had one moments concern about the organisation behind the holiday." Social & Environmental Responsibility: "All the local staff seemed genuinely delighted that we had come to see their country, and to provide jobs for the community that otherwise wouldnt have existed. " Just astonishing facilities in the middle of nowhere! 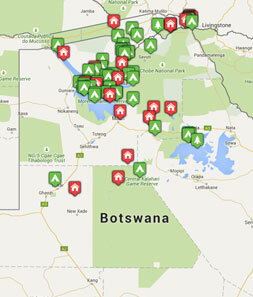 Great staff, amazing food, superb tents with 'the hottest wettest showers in the Kalahari' - probably true! Hosts Fabio and then Kat happy to take time to chat and listen to any concerns we had (none). Even Cathy was impressed with the bush shower and toilet. Probably not the right place for her to get ill (probably dehydration/heatstroke) especially with frequent visits from elephants and hippos when on her sick bed, but the staff were very caring and considerate, even contacting the next camp to make sure she was better. Jaw dropping food from the 'magic box' in the kitchens. Absolutely superb. Good wildlife, great staff, wonderful site, lovely food. Very comfortable lodges. Very pleasant main buildings/dining area. Fantastic staff, excellent food. Fantastic place for R&R - if you need it - after exhausting safaris. Possibly tries a little too hard with the food (not sure about the need for sorbets between courses as tended to be melted by the time they were eaten). Very organised with excellent facilities especially transport. Massage very relaxing for Cathy. Generally very luxurious and splendidly comfortable.